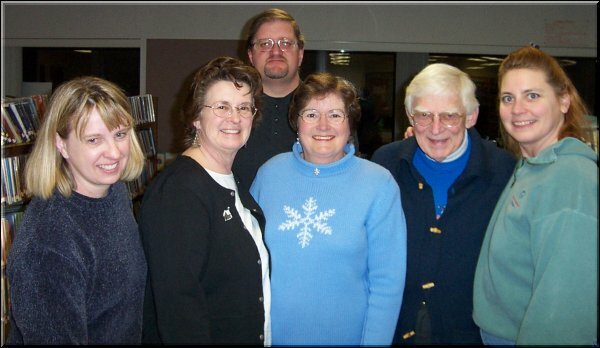 Fairfax Historical Society guest, Elaine Salsbury, from South Hero, who grew up in Jericho where her 4-H group helped start the "Snowflake" Bentley museum, was our guest on Sunday February 16th at 7pm in the Fairfax Community Library. Elaine gave a very interesting and informative presentation on "Snowflake" Bentley. Wilson "Snowflake" Bentley was a self-educated farmer/scientist/photographer who lived his entire life in Jericho, Vermont. In 1885 he took the very first photographs of snowflakes and continued this work until his death in 1931. He found them all to be different and coined the well-known expression that "no two snowflakes are alike". 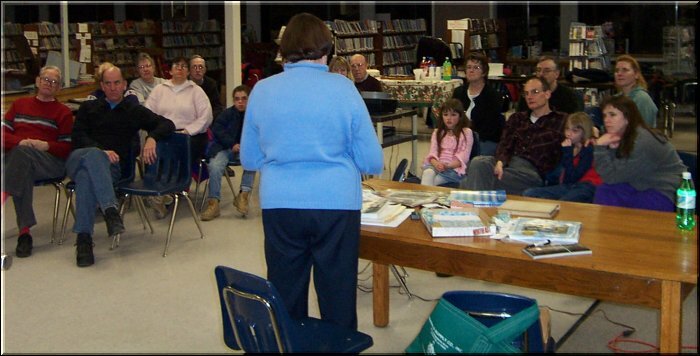 She discussed the life and times of the snowflake man while showing slides of Bentley, his work with snowflakes, frost and dew, clouds, insects and the surroundings in which he lived. Elaine is a wealth of information and answered many questions for the Georgia/Fairfax guests who attended. 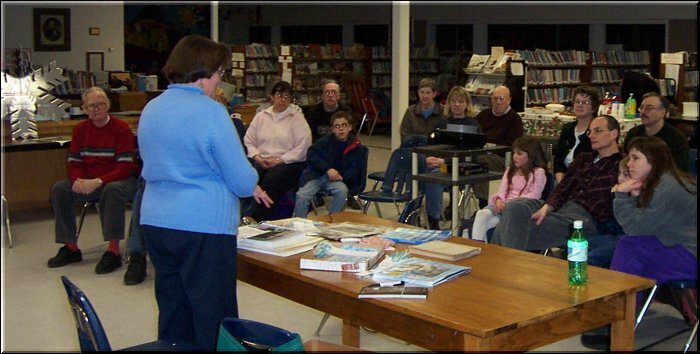 An excellent presentation on Wilson "Snowflake" Bentley was presented by Elaine Salsbury last night at the BFA Library. She had some excellent information on his life and times and will be presenting to the 3rd grade class here at BFA in several weeks. Although the presentation will be a little shorter, it should prove very interesting seeing as how Jericho is just a hop and a skip away from us. Just about everyone has heard about "Snowflake", however, Elaine stated that the people of Jericho did not think that highly of him. They thought he was really weird and after his death when about 10,000 of his slides were sold for $500, they had no interest in them. Throughout his lifetime, "Snowflake" sold his slides for .05 each and never raised his price. He was born in 1865 and died in 1931. He even went to Alaska to photograph snowflakes, but found that the best place to photograph them was right here in Jericho. Although I had not heard of it, he also extended his photographic skills to dew, frost, clouds and even insects. How he photographed the insects, I will not mention here as probably the animal rights people would be pretty upset. Elaine showed photos of his home in Jericho and stated he is also buried there. After this excellent presentation, Elaine Kirkpatrick provided the group with delicious carrot cake, chocolate cake and cookies and drinks. By the way, if you haven't tasted Elaine's desserts, you have really missed something. Her usual excuse for bringing in the goodies is, "Well, the stove was going anyway, so might as well utilize it." Well, she can utilize that stove just as much as she wants as far as I'm concerned. What a great lady. 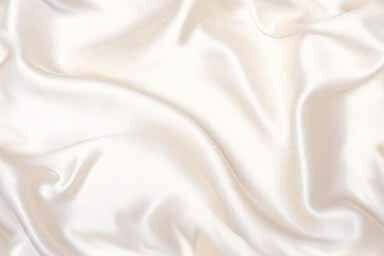 I have also listed a website on the Internet where you can get more information on "Snowflake", however, I would encourage you, if you ever get a chance to see one of Elaine Salsbury's presentations, by all means take the opportunity and also visit the "Snowflake" Bentley Museum in Jericho.